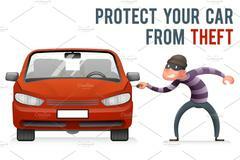 Moorestown & area towns are experiencing overnight car burglaries. Please lock you car to avoid becoming a victim. Moorestown and other area towns have been experiencing overnight car burglaries. Our officers have concentrated patrols in neighborhoods overnight that has resulted in the arrests of two of the perpetrators. Help us prevent crime. Don't hesitate to call for the police if you see suspicious activity at 856-234-8300. Call 911 if you see a crime in progress. •Do move valuable items to the trunk while in public view. •Do not leave items with personal identifiers in plain view. •Do not leave keys and starter FOBs in the vehicle. •Do not leave the garage door opener in plain view. •Do not leave windows or a sunroof open. Residents are encouraged to visit the Police Department website www.moorestownpd.com for additional crime prevention tips.